Fresh hop beers are fermenting away from the East Coast to the West Coast, and we can look for them on tap soon. Most will be available only close to where they are brewed, although Sierra Nevada is bottling its Harvest Ale this year and Deschutes Hop Trip can be found in several states. The number of fresh hop/wet hop festivals keeps growing as well. Too many to list, so check our festival calendar. – Hunt’s Hop Tea. Recipe included (it’s easier with fresh hops). – Pernicious myths and a ban on hops. What really happened in Shrewsbury at the start of the 16th century and were hops not only banned but labeled a wicked and pernicious weed? 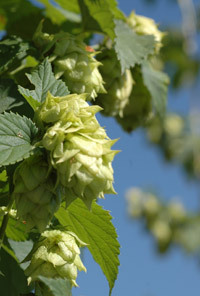 – Mom grows a bumper crop of hops. A hop shortage ahead? Perhaps mothers across the nation will come to the rescue. – Samuel Adams creates an ode to noble hops. That hop would be Hallertau Mittelfrueh to the tune of 110 IBU.